In 1959, Berry Gordy gathered the best musicians from Detroit's thriving jazz and blues scene to begin cutting songs for his new record company. Over a fourteen year period they were the heartbeat on "My Girl," "Bernadette," I Was Made to Love Her," and every other hit from Motown's Detroit era. By the end of their phenomenal run, this unheralded group of musicians had played on more number ones hits than the Beach Boys, the Rolling Stones, Elvis and the Beatles combined - which makes them the greatest hit machine in the history of popular music. They called themselves the Funk Brothers. Forty-one years after they played their first note an a Motown record and three decades since they were all together, the Funk Brothers reunited back in Detroit to play their music and tell their unforgettable story in STANDING IN THE SHADOWS OF MOTOWN. With the tumultuous sixties as a backdrop, Motown's unsung heroes take the viewer on a compelling journey in time as they trace the evolution of The Motown Sound" from its origins in Detroit to its demise in Los Angeles during the seventies. Through the eyes of the riveting characters who ruled Hitsville's studio by day and the club scene of Detroit by night, we enter a world of unparalleled soul and emotion as the Funk Brothers revisit the sites of their musical roots, triumphs, and eventual heartbreak. For more than four decades, from the dance floors of the world, to the Detroit riots of 1967, to the war in Vietnam, the music the Funk Brothers created has played a major role in the cultural fabric of all of our lives. 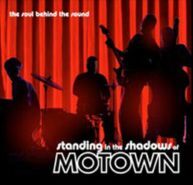 STANDING IN THE SHADOWS OF MOTOWN finally puts some faces on that music and introduces these heroic musical figures to the world.